Recent changes to Office 365 tenants to be FedRAMP-compliant is causing problems for some users with personal and government email accounts in the Outlook apps for Android and iOS. 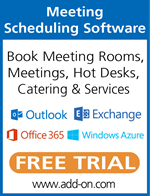 How to copy appointments from several Outlook calendars to print as one calendar. Includes code specific to Exchange server accounts that works with Resource calendars as well as other user's calendars. After importing IMAP folders to Personal Folders or an Exchange mailbox, messages in the imported folder are hidden. Use a macro to clean up duplicates messages in an Outlook folder. Use a VBA macro to resize large images in received email. Microsoft has scheduled webinars to highlight cool tips and tricks to save you time and effort using the Outlook mobile apps. You’ll also be able to questions and share feedback with the Outlook mobile team directly. How well could you manage without a mouse in Outlook, using only keyboard shortcuts ? How to assign, change, or remove folder permissions in an Exchange mailbox using Outlook VBA and Redemption. Outlook doesn't support creating shortcuts to folder on the Quick Access toolbar (QAT) or ribbon, but you can put macro on the QAT or ribbon that opens a folder.